Lifesource Yoga Summer Series For Kids! School’s out and the summer season has begun. Make your family’s summer even better by enrolling your young ones in the Lifesource Yoga summer series for children. The series will run as three sessions designed for recommended age ranges. 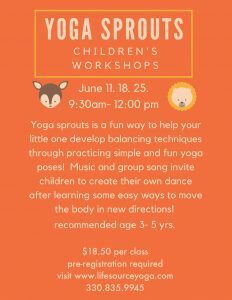 “Yoga Sprouts”, recommended for ages 3-5, will be held on three Saturdays in June (11, 18, & 23) from 9:30 – Noon. This is a great way to introduce little ones to the very basic concepts of yoga postures and enjoy dance, music, and song.